Although the focus in the garden is on perennials, I've added several perennials this year to fill in gaps and it is working quite well. I decided that growing Lobelia was too much trouble, so I just got a tray of 25 and put some in the containers and the rest around the edges of the beds. They are mixed colours and so provide a bit more interest. I also got a tray of 20 mixed Pelargoniums which have also gone into the containers and spread out in gaps in the beds. They have grown at vastly different rates depending on where they were planted which is interesting information. Down the side of the house where even the weeds don't grow, they have remained almost the same size as when they were planted and yet have flowered first. In the containers they have grown very large, and yet were the last to flower. So I don't know what to make of that. Rest were sown as seeds. This year they were all sown outside or moved directly outside as soon as they germinated. Cosmos sulphureus Ladybird mixed. This is a different Cosmos than the usual bedding Cosmos. For some reason it took me a long time to recognise this even though they are very different. They are more compact with less feathery leaves. They look somewhat like a marigold. A couple are in containers the rest spread around the right hand flowerbed. Only one is flowering so far. Eschscholzia californica. These are mainly in the containers but a few were planted out in the ground. Antirrhinum 'Night and day'. All planted out into the ground. These are now flowering nicely (see below). Very pleased with these. They may survive the winter. Zinnia elegans Whirlygig mixed. Mainly planted directly into the containers. Have two in the ground which seems to be doing ok although not flowering yet. Penstemon hartwegii. I'm including them here although they are perennials as they may flower this year. No sign so far. They may not survive the winter. My penstimon was one of the three plants I lost over the winter. 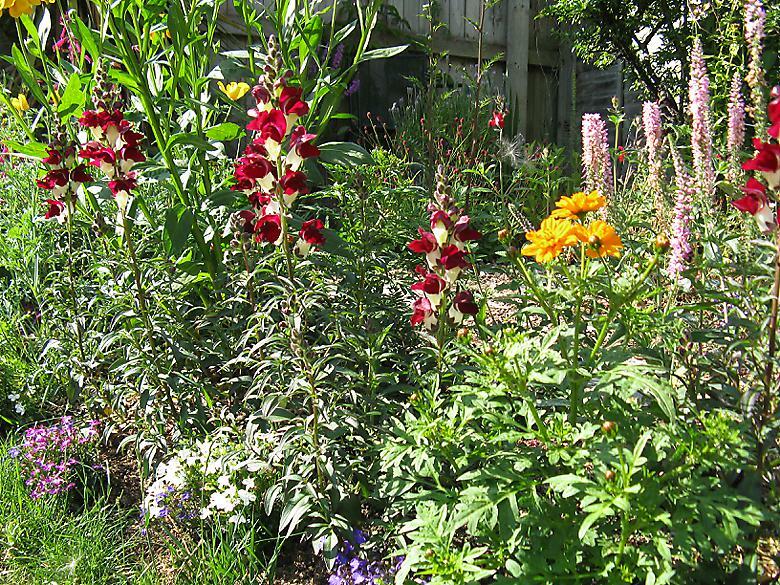 The picture shows the Antirrhinum and a Cosmos, with the Lobelia along the bottom.